It has now been four years since Scotland was told by the Tory Westminster government and No campaign that in 2014 the way to protect Scotland’s place in Europe was to vote No, we now find ourselves being dragged out of the EU against our will and towards an extreme Brexit – but unfortunately for people in Scotland, this is only the most obvious of the broken promises from the anti-independence parties. Now, Scotland faces being dragged out of the EU against our will and towards an extreme Brexit, despite the fact that all 32 of Scotland’s local authorities and 62% of Scotland’s population voted to remain within the European Union. A Best of Britain poll in August 2018 found that 52 per cent of people in Scotland would vote for independence if the United Kingdom left the European Union. As part of “the Vow”, the then three Westminster party leaders promised “extensive new powers” for the Scottish Parliament. What they legislated for left decisions about 70 per cent of Scottish taxes and 85 per cent of current UK welfare spending in Scotland in the hands of the Westminster government. The STUC and numerous third sector groups expressed disappointment at the limitations of what was finally legislated for. The Scottish Parliament’s cross-party Devolution Committee said that the Scotland Bill “falls short” in “critical areas”. And to make matters worse, following on from the EU referendum result, the UK government have attempted to undertake a power grab on powers that should be returned to Scotland in the result of Brexit. “The Vow” clearly promised “the continuation of the Barnett allocation for resources”. In the aftermath of the Brexit vote, fresh suggestions are being raised by the Tory-right wing and others about cutting Scotland’s budget further. Brexit campaigner Lord Owen called for a vote to Leave the EU to be used as an excuse to axe the Barnett Formula, while Tory MEP David Bannerman tweeted that a “new Brexit Government should suspend the Barnett formula for Scotland” – raising the spectre of cuts to Scotland’s budget. Tory leadership candidate Michael Gove has again raised the prospect of axing the Barnett Formula. Labour’s First Minister in Wales has even suggested that a Jeremy Corbyn government would scrap the Barnett Formula. 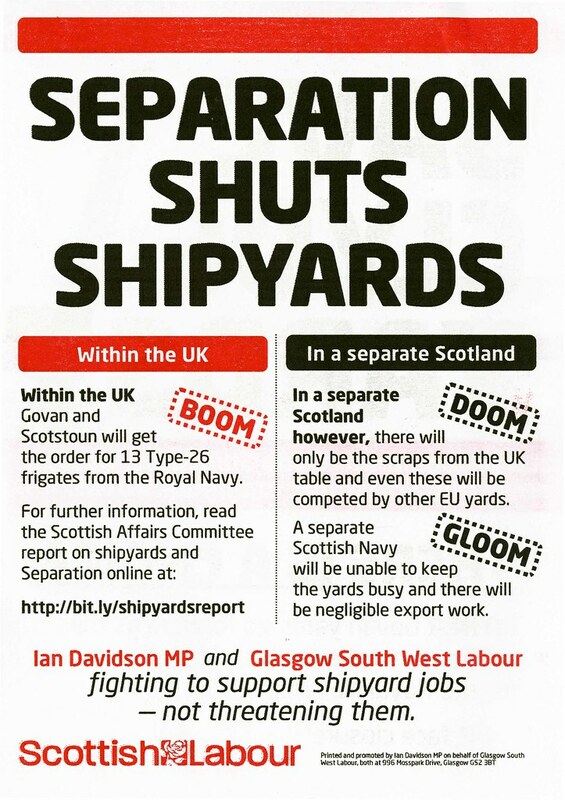 Before the referendum, the No campaign said jobs in shipyards would be under threat if there was a Yes vote. One leaflet said “Separation Shuts Shipyards” and made the promise that “Govan and Scotstoun will get the order for 13 Type-26 frigates from the Royal Navy”. However, on 7 November 2015, the Scotsman reported that the programme could be slashed because funding was required to pay for Trident. On 23 November 2015, the UK Government announced the number of frigates would be reduced from thirteen to eight. Now the Tories have announced that the programme for the next generation of frigates – the Type 31e – has been suspended. Making it worse the announcement was cynically sneaked out on the last day of parliament, so ministers could avoid scrutiny. Before the referendum, the Scotland Office issued a press release boasting that the UK Government protects civil service jobs in Scotland. Information from the Scottish Parliament Information Centre, published in 2016, shows that between 2011 and 2015, there was a greater fall in UK Civil Service employment in Scotland than in any other UK nation – falling by 17.5 per cent in Scotland, compared to 12.4 per cent in England, 9.3 per cent in Wales and 16.1 per cent in Northern Ireland. Before the referendum it was claimed that, within the UK, HMRC delivered a ‘jobs dividend’ in Scotland. The UK Government has since announced closure of HMRC offices – risking over 2,000 Scottish jobs. Before the referendum, the No campaign stated that “we are better placed to support the most vulnerable in Scotland” with a No vote. Yet after voting No, Scotland has been subjected to four more years of Tory austerity and cuts to social security. In 2015, George Osborne announced £12 billion cuts and changes to welfare and benefits. The Child Poverty Action Group said the budget cuts damaged economic security of working families “with higher child poverty for millions and lower taxes for the better off”. Scotland’s black grant has also been cut by consecutive Conservative Chancellors, with over £2.6 billion to be cut from Scotland’s budget over the decade until 2019/2020. At PMQs David Cameron argued for a No vote on basis that “…when it comes to vital industries like green technology, the combination of a green investment bank sponsored by the United Kingdom Government and the many natural advantages that there are in Scotland can make this a great industry for people in Scotland—but we will do that only if we keep our country together”. On 7 April 2014 Energy and Climate Change Secretary Edward Davey said: “The broad shoulders of the United Kingdom is unlocking the power of Scotland to take its place as one of the world’s great energy hubs – generating energy and generating jobs”. Before the referendum, the UK Government stated: “Scotland benefits from other competitions and grants provided by the UK Government and the wider UK consumer and tax base, such as a programme to support the commercialisation of carbon capture and storage”. This commitment to a £1billion investment in CCS was also set out in the Conservative’s 2015 manifesto. The UK Government cancelled this investment six months before it was due to be awarded. Peterhead power station was one of two projects bidding for the investment. Before the referendum, Scotland was told that we were an equal part of the UK ‘family of nations’ and were urged to ‘lead not leave’ the UK. The morning after the referendum David Cameron announced English Votes for English Laws (EVEL) – creating the situation where Scottish MPs cannot properly consider the ‘Barnett consequentials’ on legislation deemed English only.